The beginning of the left movement in Sri Lanka goes back to 1935. The first leftist political party, Lanka Sama Samaja Party (LSSP-Lanka Equal Social Party) which was founded in that year, became one of the largest national sections of the Fourth International during 1950’s and 1960’s. The birth of the Communist Party of Sri Lanka (CPSL) was due to the split of the LSSP in the year 1943. The CPSL later split into two factions along the lines of Moscow and Peking after the Soviet Union and The People’s Republic of China fell out. Since then Sri Lanka had two Communist Parties, The CPSL (Moscow) and The CPSL (Peking). Since 1964 all three parties have been losing their support bases. The CPSL (Peking) no longer exists. Both the LSSP and the CPSL (Moscow) are now vulnerable and weak; independently they do not have any influence in the politics in Sri Lanka. The year 1964, marked the beginning of the end of the old left movement -the LSSP and the CPSL. The bourgeois government that came to power was caught in a deep economic-political-social crisis for which it had no solution. The people of Sri Lanka, led by workers organised by the trade unions of the left parties were on the verge of bringing down the government and taking the United Left Front to power. At this critical moment first the LSSP, and soon after that the CPSL, joined the bourgeois government against the will of their trade unions and hundreds of thousands of people who supported them. The betrayal of the workers in particular and the wishes of the people in general created a very favourable situation in which to launch a new left movement. A son of a member of the CPSL, Comrade Rohana Wijeweera had the influence of his father’s politics when he was only 16 years old. Having won a scholarship to study medicine at the Friendship University, (later renamed the Patrice Lumumba Friendship University), he had the opportunity to study Marxism-Leninism at the party school of the Communist Party of the Soviet Union (CPSU). He was critical of the revisionist line of the CPSU under Khrushchev, and as a result he was refused a visa to re-enter the Soviet Union on his return from Sri Lanka during the vacation in1964. Subsequently, Comrade Rohana joined the CPSL (Peking) and became a full time activist in its youth wing. Having convinced himself that the Peking Wing was equally revisionist as the CPSL (Moscow), he led an ideological struggle against the leadership and its opportunist political line. On the14th May 1965 at Akmeemana in Galle district Comrade Rohana Wijeweera held a discussion with six other members of CPSL (peking) to launch a campaign to correct the party ideologically. The Leaders of CPSL (Peking) who came to aware of the discussion expelled comrade Rohana Wijeweera and six others from the party. Comrade Rohana Wijeweera had enough courage to take the initiative to grab the opportunity and fill the void created by the betrayal of the people by the old left in 1964. The final outcome of the discussions was a complete agreement of the others with comrade Rohana, to start building immediately a new political party which could lead the people to establish a socialist government in Sri Lanka. Comrade Rohana Wijeweera was the first ever Sri Lankan involved in politics who did not come from a wealthy family. He built a formidable political party that shook the very foundation of a system based on deception and exploitation. Initially the organisation of workers, farmers, students and the youth had to be carried out in a semi-clandestine manner, in order to avoid the suppression of this new political movement by the government of an extreme right political party, the United National Party (UNP) that had come to power in 1965 general election. The nascent revolutionary political party under went severe difficulties during its first three years. Comrade Rohana Wijeweera and others had to do odd jobs to find money for party work and for their survival. Comrade Wijeweera was very successful in organising the University students, then the workers and the farmers. As a result of the betrayal of the old left the workers and the farmers had lost confidence in the Left. It was not difficult to comprehend why the workers and farmers took more time to join Comrade Wijeweera. The activities of the students’ movement spread to all universities and higher educational institutions. The UNP regime identified that there was a political movement in action among the workers, farmers, and youth and particularly among students. The intelligence services were given orders to pursue the leaders of the new movement. 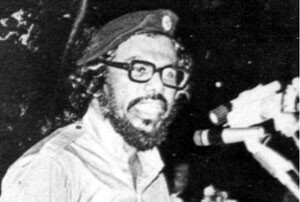 On the 12th of May 1970, Comrade Wijeweera was taken into custody without charges, and the government propaganda machine carried out a campaign against Comrade Wijeweera and the new movement. The new movement was labelled as the Che Guevara movement. The people of Sri Lanka for the first time came to know that there was a new political party and that its leader was Comrade Rohana Wijeweera. The coalition of Sri Lanka freedom party (SLFP) and the old left came to power in May 1970. In the month of July 1970 the courts found Comrade Rohana was not guilty on all charges framed by the government. After his release from custody on the 9th of July 1970, the new political movement achieved a new momentum. The coalition government of the bourgeois SLFP and the old left was perturbed by the progress of the new left movement and started a campaign to tarnish its image. Comrade Rohana Wijeweera holding a press conference announced that the new political movement named as Janatha Vimukthi Peramuna (JVP - Peoples Liberation Front) and it would hold its first ever public rally to announce its existence and educate the people about its policies and future political activities. On the 10th of August 1970, the day JVP was to hold its maiden rally in Colombo. The three general secretaries of the three political parties, namely, the SLFP, LSSP and CPSL issued a joint statement branding JVP as a CIA trap, and Comrade Wijeweera as a CIA agent. The Maiden Rally of the JVP was extremely successful and the people who participated when requested by Comrade Rohana Wijeweera donated money and jewellery they were wearing. The JVP held public rallies in other cities and launched three newspapers: The Janatha Vimukthi (Peoples Liberation), central organ of the JVP; Rathu Balaya (Red Power), central organ of the workers wing; and Deshapremi (The Patriot), central organ of the student’s wing. The Coalition government, intensifying its repression, took steps to arrest activists of the JVP who carried out political activities such as poster campaigns, conducting educational discussions and camps. These are legal political activities under normal conditions in Sri Lanka. The JVP activists taken into custody were tortured while in custody at Police Stations. When these activists brought before the court of law they were found not guilty under the constitution of Sri Lanka. The coalition government then put in place further provocative and repressive measures to thwart the activities of the JVP. The government was hunting for a situation favourable for enforcing emergency laws throughout the country. On the 6th March 1971, a group of supporters of the government (led by few Members of the Parliament belonging to the coalition government) organised a march against American’s war in Vietnam. While marching in front of the American Embassy someone among the demonstrators hurled a petrol bomb into the premises of the American Embassy. Later the person who hurled the bomb was arrested while trying to escape from the scene on a motor bicycle. He was found to be not a JVP member but a supporter of one of the Members of the Parliament who took part in the anti American demonstration. Within a few hours of this incident, the government declared a state of emergency giving sweeping powers to the armed forces and the police, including disposal of bodies without holding a post-mortem or judicial inquiry. Under emergency regulations Comrade Wijeweera and many other members and sympathisers of the JVP were taken in to custody. Comrade Wijeweera was taken into custody on the 13th March 1971 and kept incommunicado in Jaffna Prison which is 395 km away from Colombo. He did not violate the law of the country. By the 1st of April 1971 more than 500 members and sympathisers of the JVP were taken into custody and kept in prison camps. The leadership of the JVP met on night of the 1st of April 1971 and had a serious discussion about the ongoing repression by the government. Special attention had been given to the powers of the police and armed forces for the disposal of dead bodies without holding post-mortems. The JVP at this critical moment took into serious consideration the annihilation of peaceful revolutionary movements in the world. The JVP leadership decided to take up arms against the repressive measures of the government which had provoked the armed forces, police and the people against the JVP. The JVP wanted no repetition of what had happened to the entire Communist Party in Indonesia in 1965. The military Junta led by General Suharto had been able to annihilate almost the whole Communist Party including its supporters because the Communist Party of Indonesia believed blindly that the military junta will allow it to carry out its activities peacefully. In contrast the JVP wanted to fight back and safeguard its dignity and the right to build their party under the law of the country. The JVP decided to arm itself at the beginning of the year1971 for the purpose of self-defence. The JVP was compelled to take up arms on 5th April 1971 against the unlawful, unjust repression of the government. The government lost control in certain areas when nearly one hundred police stations were attacked and abandoned by police officers. A brutal repression was launched by the Government The April uprising was totally suppressed within one month after killing nearly 10,000 members and sympathisers of the JVP. The people of Sri Lanka have never witnessed the slaughter of people in public before 1971. To quell the JVP, the government had to take in to custody further 20,000 JVP members and sympathisers. For the suppression of the JVP, it has to be noted that 14 other countries supported the government; in fact the Indian government sent its Air Force pilots and MIGS to fight the JVP. After the suppression the government, used new methods, learnt from other countries, to brainwash or to so-called “rehabilitate” the members of the JVP who were in custody and prison camps. The JVP was able to re-organise within a short time throughout the country and within the prison camps. The JVP held serious discussions regarding its activities and experiences before April 1971 and during the period from 1971-1974. The JVP identified its past mistakes and took serious action to correct them in order to re-organise. Meanwhile the government faced a dilemma. It was instructed by the Attorney-General that there are no provisions according to the common law of the country to prosecute the JVP members who had been taken into custody without arms. Particularly, the leader of the JVP Comrade Rohana Wijeweera who had been arrested and kept in custody prior to the uprising had to be released once the emergency laws lifted. The government with total support of the opposition passed the Criminal Justice Commission Bill in the parliament. Violating the natural law for the first time in Sri Lanka a bill was passed in the parliament to prosecute those who were alleged to have been responsible for an offence committed in the past. The Criminal Justice Commission conducted its investigation into the 1971 uprising with the intention of deceiving people. In 1975, Comrade Rohana Wijeweera was sentenced to lifetime imprisonment, thus violating even the Criminal Justice Commission Bill. Consequently, it was amended to 20 years rigorous imprisonment. The class character of the CJC was more than clear and visible to everyone. Not even one year passed after the sentencing before the demand emerged from the people to release all political prisoners unconditionally. The workers and students launched agitations and demonstrations against the emergency laws and demanded the immediate release of political prisoners. In 1976 the emergency laws were lifted and the proscription of the JVP came to an end. It could once again function as a legal political party. In early 1977, the general election was held and the UNP (United National Party), a conservative and right wing party) came to power. Before coming to power it pledged to release all political prisoners but there was an unreasonable delay of releasing them after they grabbed the power. The campaign for the release of political prisoners renewed its demonstrations. Eventually the UNP government had to release all political prisoners including comrade Rohana Wijeweera. The release of Comrade Rohana Wijeweera and other political prisoners contributed tremendous momentum to the JVP. The party could establish itself among the workers, students, and youths and paid attention to spreading its influence in the international arena. The JVP sent a delegation of 5 members to the 11th Festival of Youth and Students held in Havana in 1978. It was a successful move in establishing friendly relations with socialist parties in the world. The JVP held its first national congress in the year 1978 and the national congresses of the junior organisations during the period of 1979-1980. It contested the Colombo (the capital city of Sri Lanka) Municipal Council elections for the first time in 1979. Although it was not successful in winning seats in the council, it defeated for the first time the old left coalition and established itself as the third largest political party in Colombo. In 1981 the JVP contested the island wide election of the District Development Councils and was able to win 13 seats. In 1982 Comrade Rohana Wijeweera contested the presidential election. Only one month before the Election Day the JVP was registered as a recognised political party in Sri Lanka by the Commissioner of the Elections. According to the results of the Presidential Election, the JVP became established as the third largest political party in the country. The UNP was very worried about this development and the steady progress of the JVP. The UNP leaders made public statements to the effect that they treated the JVP as the real and the main enemy and that appropriate actions would be taken to silence the JVP. First the UNP government decided to hold a referendum to postpone the parliamentary elections due to be held in 1983 for another 6 years, in order to prevent the JVP entering the parliament of Sri Lanka. Meanwhile, the UNP regime made a series of mistakes in trying to suppress the 11 year’s old armed struggle of the Tamil Separatist Organisations in the Northern Province of Sri Lanka. Lack of political will and vision of the government that led to an escalation of armed activities and to the launch of civil war in July 1983 after an army truck was exploded by the detonation of a powerful landmine, killing 13 soldiers. Public anger against the Tamil separatists was aroused and some leaders of the government and their private armies of thugs seized the situation to attack innocent Tamil people in Colombo and other cities. President J.R Jayewardene hatched a conspiracy against left parties including the JVP, blaming them and the Soviet Union for instigating anti-Tamil riots. Most shameful and blatant lies were spread using state media; the JVP and two other left parties were proscribed undemocratically, unjustly and illegally. India was unhappy with the President Jayewardene’s pro-US foreign policy. India provided material and moral support to the Tamil Separatist organisations, ignoring its long term strategic interests. More than 100,000 Tamils in the North of Sri Lanka fled to India. India has been burdened with Sri Lankan refugee crisis since then. The crisis created by the National Question of Sri Lanka finally led to the direct interference of India into internal affairs of Sri Lanka. The JVP took every attempt to convince India, our friendly and the closest neighbour for centuries, not to get involved in the political mess in Sri Lanka. The JVP was not successful in convincing India, and as a result had to oppose India, the pro-US Sri Lankan government, and the separatists who fight to dismember Sri Lanka and create an ethnically cleansed entity called Tamil Ealam that will destroy the hitherto enjoyed unity of the people. In 1987 July the then President of Sri Lanka, J.R.Jayawardene of the UNP, was compelled by India to sign the Jayewardene - Rajiv Gandhi accord or the Indo-Lanka accord that allowed the Indian Army to enter Sri Lankan waters and land. The JVP then had only one option to prevent the abdication of sovereignty and the division of Sri Lanka. The JVP took the correct decision to launch an armed struggle to defeat all enemies of Sri Lanka. The majority of people of Sri Lanka supported the patriotic struggle until it was crushed by the UNP regime who engaged paramilitary groups and state sponsored killer squads to kill more than 60,000 people. Most of the members of the Central Committee, and all but one member of the political bureau of the JVP, were arrested and killed while they were in custody. The JVP had to face a set back, although temporary. The only surviving member of the Political Bureau comrade Somawansa Amarasighe fled the country and re-organized the party from abroad. The members of the JVP who lived underground among the people, in the jungles, in the prisons and abroad, worked hard to carry out their political activities. The UNP regime became unpopular and weaker after 1993, the year in which the heroic people in the Southern province of Sri Lanka defeated it, without fearing intimidation, at the provincial council elections for the Southern Province. The people made the emergency laws unworkable and a favourable situation had been created for the JVP to enter legal politics again. The JVP contested the general elections held in 1994. It was able to forge an alliance, the National Salvation Front, with the Sri Lanka Progressive Front. The National Salvation Front won a single seat out of 225 in the Sri Lanka parliament. Comrade Nihal Galappththi was appointed as the member of the parliament for Hambantota district in the Southern Province of Sri Lanka. Comrade Galappththi tendered his nominations as the candidate of the JVP in the Presidential election in November 1994. He withdrew his nominations in favour of Mrs. Chandrika Bandaranayake Kumaranatunga (the presidential candidate of the SLFP) who had given an assurance to the JVP and the people of Sri Lanka that she would abolish the Executive Presidency, hated by the people as a dictatorial post, within one year of becoming president of the country. She hasn’t fulfilled her promise. In May 1995 the JVP held an extra-ordinary congress at the city of Tangalla in the South. The new Central Committee was elected at this congress. The JVP offered conditional support to the People’s Alliance government when the defeated UNP was hatching a conspiracy to topple the government and agreed to sign a Memorandum of Understanding (MOU) that assured benefits for the ordinary people in the country. However, one month after signing the MOU, a few ministers betrayed the PA government and joined the UNP. As a result the government was dissolved and the general election was held on 5th December 2001. The PA lost the election. The 4th congress of the delegates of the JVP was convened in Colombo in 2002. From 1977 until 2002 the JVP attracted thousands of workers, farmers, youths, students and women into its ranks. As the membership increased rapidly a congress of the delegates had to be held. The UNF (United National Front) that came to power in 2001 implemented an anti-people, pro-imperialist, pro-separatist programme. The JVP had to take action to defeat the UNF government as soon as possible. The people of the country led by the JVP demonstrated their opposition to the government. Meanwhile the JVP had important discussions with the SLFP to forge an alliance on a program based on people-friendly policies to stop the re-colonisation and division of Sri Lanka. After having discussions for more than 10 months the SLFP and the JVP formed the United Peoples Freedom Alliance (UPFA) in January 2004. To prevent the deterioration of the security of the country the President dissolved the parliament. The general election was held on the 2nd of April 2004. The cabinet of ministers of the new Alliance government consisted of 4 members from the political bureau of the JVP. The election manifesto and the Programme of the UPFA were based on two main demands of the people. Stop Re- colonization of Sri Lanka. Stop division of Sri Lanka along ethnic lines. Since it came to power the other partner of UPFA, as they had done in the past, attempted to implement policies that did not have a mandate from the people at the general election in 2004. The JVP had to work hard to stop these anti- people policies being implemented by the UPFA government. The JVP was vigilant and always took the responsibility of implementation the policies that had received a mandate from the people. The JVP is the only political party that constantly reminded the government about the mandate it had received from the people. By the end of the year 2004 the SLFP submitted a cabinet paper with a proposal to privatise the Electricity Board under the pretext of reducing losses incurred by the board. The JVP protested and wanted the government to abandon the proposal. The UPFA government and the UPFA itself reached the point of collapse when the SLFP attempted to ignore the election manifesto. The JVP announced its withdrawal from the government and the UPFA if the policy of privatisation crept into the manifesto of the UPFA. Eventually the SLFP withdrew its proposal and the UPFA did not collapse. Later at the beginning of the year 2005 the President and a few deputy ministers of her government wanted to sign another MOU with the LTTE on establishing a Joint Mechanism to manage Tsunami- affected people in the country, particularly in the Northern and Eastern provinces. When the so-called joint mechanism between GOSL (Government of Sri Lanka) and the LTTE was being discussed, the JVP again pointed out that any agreement aiming to transfer power to the LTTE should not be signed by the government as it would violate the MOU signed by the JVP and the SLFP, and also the election manifesto of the UPFA and also the constitution of Sri Lanka. The JVP warned the government and the President not to take steps to sign an agreement that would violate the constitution of Sri Lanka and encourage the separatists in their aim of establishing a separate state in the Northern and Eastern provinces of Sri Lanka. The President succumbed to the conspiracy of the both national and international reactionaries. In secrecy she agreed with the LTTE to sign the so called P-TOMS (POST TSUNAMI OPERATIONAL MANAGEMENT STRUCTURE) agreement. As it had announced, the JVP withdrew from the UPFA and the government on the 16th June 2005, before the signing of the agreement on 24th June 2005. The JVP established new tradition in Sri Lankan politics. It initiated a new political culture in Sri Lanka. During the last 40 years since its emergence in 1965 the JVP produced the volunteers who have served the people without receiving a salary or an allowance from the party. All the representatives of the JVP elected by the people transfer their salaries and other allowances to a Common Fund. This fund provides monies for projects proposed by the people themselves. The JVP is the first political party in Sri Lanka that has transferred the tax payer’s money back to them in the form of various services to the people. The JVP produced Ministers who were not involved in corrupt practices. They saved public funds by stopping waste and by rejecting luxuries. They sold their luxury vehicles and used the money to cheaply transport ministry officials. For the first time Sri Lankan people saw lights lit until late in the night at all four ministries manned by the JVP. They worked hard and demonstrated that they could deliver a better service to the people. the agriculture ministry manned by the JVP during the 14 months since April 2004 was successful in achieving the highest paddy harvest in Sri Lanka since gaining independence in 1948. The JVP during the last four decades produced the most honest, dedicated, committed, and efficient politicians in Sri Lanka. Most of all, the JVP produced a humble servant of the people of Sri Lanka.